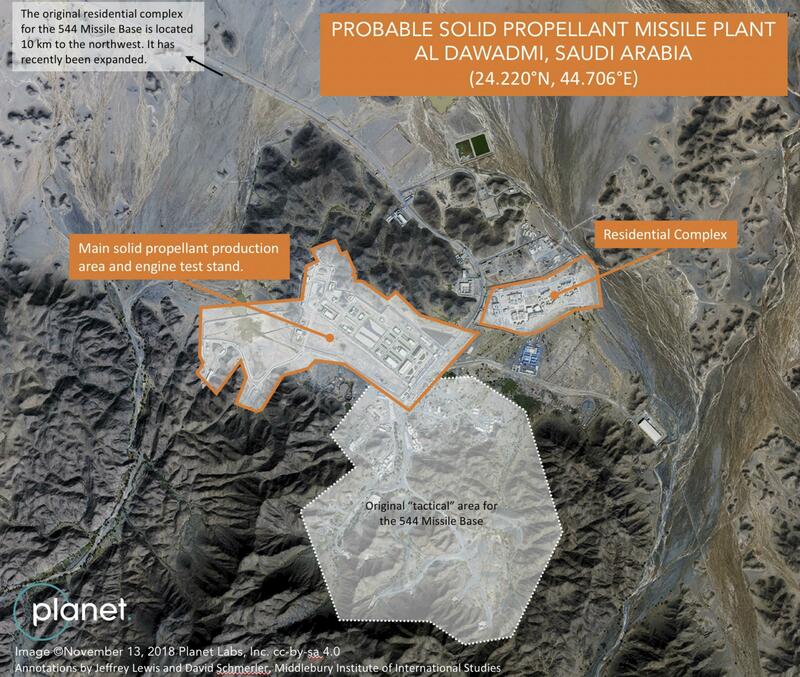 Sat., Jan. 26, 2019, 4:49 p.m.
DUBAI, United Arab Emirates – A military base deep inside Saudi Arabia appears to be testing and possibly manufacturing ballistic missiles, experts and satellite images suggest, evidence of the type of weapons program it has long criticized its archrival Iran for possessing. Further raising the stakes for any such program are comments by Saudi Arabia’s powerful Crown Prince Mohammed bin Salman, who said last year the kingdom wouldn’t hesitate to develop nuclear weapons if Iran does. Ballistic missiles can carry nuclear warheads to targets thousands of miles away. The images, first reported by the Washington Post, focus on a military base near the town of al-Dawadmi, some 145 miles west of Riyadh, the Saudi capital. Jane’s Defence Weekly first identified the base in 2013, suggesting its two launch pads appear oriented to target Israel and Iran with ballistic missiles the kingdom previously bought from China. The November satellite images show what appear to be structures big enough to build and fuel ballistic missiles. An apparent rocket-engine test stand can be seen in a corner of the base – the type on which a rocket is positioned on its side and test-fired in place. Such testing is key for countries attempting to manufacture working missiles, experts say. Iran has relied on its ballistic missiles as its own air force is largely made up of pre-1979 fighter jets. Saudi Arabia, on the other hand, has a fleet of modern F-15s, Typhoons and Tornadoes – which raises the question of why the Saudis would choose to develop the missiles. Published: Jan. 26, 2019, 4:49 p.m.